Sale Trio Spring Trims, a photo by kirstyfish on Flickr. So if you don't know that 2012 is a leap year where have you been hiding? I am so happy that we get an extra day this year, I feel like it is already flying by so the more extra time we can have the better in my eyes. 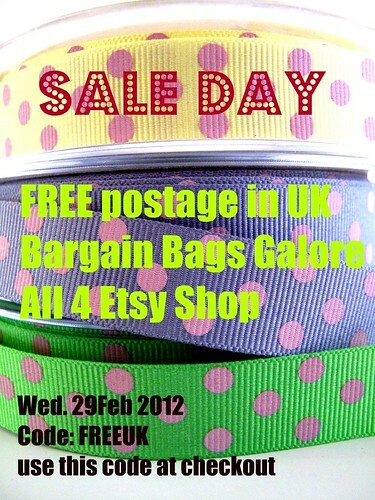 My friend Kirsty over at Paperfish is having a Sale day with free UK postage on top on the 29th February only. She has 4 etsy shops, yes 4! so you are sure to find something you like. Be it a handmade gift or some crafting supplies or even a Christmas decoration ready for December you will find it in one of her shops. I know I will be having a good flick through her pages to see what bargains are to be had. Just make sure you use the code above when you check out to get the free shipping.